This is notably one of the busiest times of the year when we are balancing work and school with a variety of seasonal commitments. Yet, it is important for us to take a moment to reflect on this year’s accomplishments and acknowledge all who have contributed to a successful year. I was incredibly honored and excited to join National University this year. 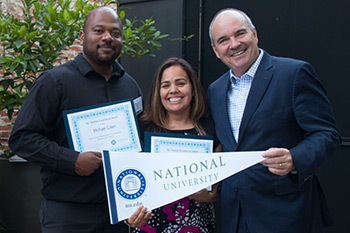 As NU is a unique university with 28 locations throughout California and Nevada, it’s been a busy year visiting our campuses and meeting the wonderful faculty, staff, students and alumni who make up this great institution. I was impressed by the fervent dedication of NU’s faculty and staff who continue to develop and improve student support programs and instructional practices toward providing the best experiences for our students. I also appreciate being a part of the National University System and am thankful for the unwavering support of its leader, Chancellor Michael Cunningham. I’m so proud of the commitment of NU’s amazing faculty, whose service goes far beyond the classroom. Under the leadership of our recently appointed provost, Dr. Gangaram Singh, NU’s six schools and colleges have developed innovative ways to give back to the communities we serve that also provide unique learning opportunities for students. Dr. Gloria McNeal, dean of the School of Health & Human Services and her team opened virtual health clinics in underserved Los Angeles neighborhoods, making healthcare more accessible for residents of those communities. 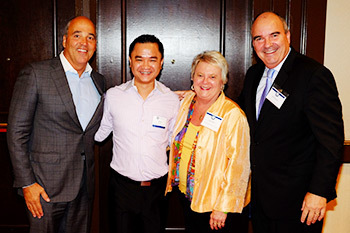 The School of Engineering and Computing led by Dr. John Cicero developed community service projects that allow students to apply their studies, such as conducting free cybersecurity audits for local nonprofits and small business, as well as refurbishing computers for families in need. And as California works to address the statewide teacher shortage, the Sanford College of Education led by Dr. Judy Mantle, contributes to the solution by recommending more teachers for credentials than any other California university. The College not only educates new teachers, but also engages in supportive and collaborative measures to inspire teachers, such as hosting more than 500 teachers at the Better Together California Teacher Summitand partnering with Teacher for America – San Diego. As I reflect on my time spent with students this year, I think back to graduation and the excitement of the students. 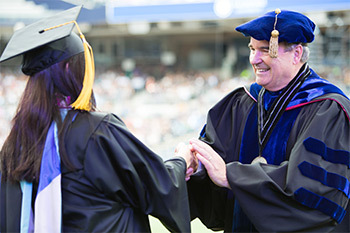 The culture of adult learners at National University created a unique commencement experience for me in Sacramento and at the inaugural commencement ceremony in San Diego’s Petco Park. It was a joy to congratulate our graduates as they crossed the stage and to see so many of their loved ones, including parents, spouses, children and even grandchildren in the audience to celebrate their achievement! I applaud the tenacity and commitment of our students to achieve their educational goals. As they crossed that graduation stage, they joined our esteemed alumni network that includes generals, admirals, entrepreneurs, city officials and over 100 county teachers of the year. In my role as President of NU I’ve had the opportunity to interact with many exciting and influential people, but the individuals that I am most inspired by are our students and alumni. Connecting with them and listening to stories of how they’ve persevered to enhance the quality of life for themselves, their families and their communities has intensified my dedication to NU’s mission of making quality education accessible to lifelong learners. As this is the season of gratitude, I’d like to thank all who have served and all who are serving in our armed forces. I’d also like to express my appreciation for friends and colleagues at National University. Thanks for all that you do for NU and for your community. I hope everyone has a safe and happy holiday season, and when we return in January, we’ll be ready to build upon our achievements of 2016 and make 2017 another great year.